We loved working with this bride SO much and are so excited to share her gorgeous wedding with you!! We are pleased to introduce you to Natalie! Doesn't she look SO amazing in her Essense of Australia gown, Bel Aire headband and Justine M. Couture veil?? Natalie was such a pleasure to work with and we would gush over her dress every single time she came into the store! The satin, the sparkle, the buttons! Everything about it is just so beautiful! I mean, right?! Natalie, you are one gorg bride! To compliment their dresses, Natalie and her bridesmaids carried beautiful bouquets created by Marco Alexzondra Floral. Before becoming husband and wife, Natalie and her hubby Jake shared a first look together. Jake's reaction to seeing his bride is so incredibly sweet! Erika Aileen Photography did such a fabulous job capturing the special moment. 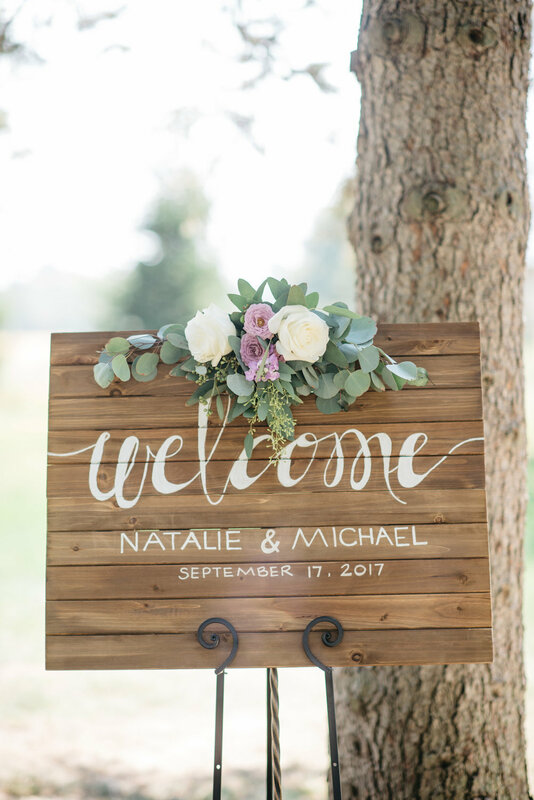 Natalie and Jake were married in a seriously gorgeous ceremony at Hidden Vineyard in Berrien Springs, Michigan. This venue, you guys! It's perfection!! Just take a look for yourself. Their reception was held on the same property and was just as gorgeous as the ceremony! We are in love with every detail! Craving more? Just check out their beautiful wedding video by My Touch Weddings! How did these lovebirds meet, anyway?? "Our story began in August 2013 in one of our Mechanical Engineering classes at Purdue University, West Lafayette. A few days into the class, I accidentally dropped my pencil and Jake picked it up for me. After the pencil drop, we started talking before and after class. Knowing that I like to workout, Jake asked me to go to the gym with him. After the gym, we went and saw a scary movie. By the end of the movie we found ourselves holding hands. Jake asked me the next day if I was holding his hand because I was scared or because I liked him. I answered, "both". Shortly after, Jake invited me to dinner at Scotty's Brewhouse. After that, we started hanging out just about everyday. When we got back from Fall Break in October 2013, Jake ordered a dozen cookies and milk from my favorite cookie shop on campus and surprised me by officially asking me to be his girlfriend. I of course said yes and the rest is history! " "On Saturday, June 25, 2016 Jake and I began our day with a trip to IHOP. After breakfast, we went to Village Canoe Rental in Milford, Michigan and took a relaxing kayak trip through Proud Lake Recreation Area. For the evening, Jake packed a secret picnic and took me to Belle Isle which is an island located in the Detroit River between the United States mainland and Canada. After dinner, Jake got down on one knee and asked me to be his wife. He then informed me that our friend, Max, was hiding and captured the entire proposal on camera. Afterwards, we celebrated by eating chocolate fudge cupcakes and by watching a fireworks show. On Sunday, June 26, the day after the proposal, we took more engagement photos, ate lunch at Red Robin, and called our families and friends to tell them the good news." "Approximately 8 months prior to the proposal, Jake had asked me if I would want to go and look at engagement rings to try to get an idea of what type of style I would like. After that, I was thinking in my head that the proposal would probably be sometime fairly soon, but I just didn’t know exactly when. So then each time after that, whenever there was a holiday, a special event, or date, I would make sure to have my nails done, just in case he were to “pop the question”." We love a girl who is always prepared! When it came time to plan their big day, Natalie's favorite part was who she got to plan it with. "Family and love is what made the wedding planning and wedding day so special. I loved being able to share precious moments throughout the wedding planning process with my family and friends and it was so rewarding to see how everything came together beautifully on the day of the wedding. My vision for the wedding was romantic elegance. I wanted the day to be a representation of our love for God, each other and our families. On the wedding day, I wore the ballet slippers that my Aunt and Cousin both wore at their weddings. I wanted to try to recreate the special “First Dance” moment for both of our parents so we had my parent’s dance to the song from their wedding 31 years ago and my husband’s parents from 29 years ago. It was also important for me to remember our loved ones that had passed away, so on my bouquet I had two pictures of my grandfathers. Before the first look, I asked someone to deliver a note I wrote to Jake as well as two small pictures of his grandfathers for him to place in his pocket to have them with him throughout the day. My wedding day was absolutely magical. As I ascended the stairs from the bridal suite, I was amazed by the beauty of the flowers, decorations, and twinkling lights. It was so special to see how all of the details that we worked on so much throughout the past 15 months of wedding planning were breathtakingly woven together to make my vision come to life. I had chosen the venue because I immediately made a connection with the catalpa tree on the property. It was my grandpa’s favorite tree on his farm growing up. Although my grandpa is no longer living, I could feel his presence as my fiancé and I stood under the beautiful ceremony tree surrounded by our family and friends. The presence of loved ones could be felt throughout the entire day and evening through smiles, hugs, laughter, and dancing. It was a perfect representation of us." Can you even?? Even her least favorite part is sweet! "My least favorite part was taking off my beautiful wedding gown at the end of the evening. From the moment I had put on my dress, I knew it was the perfect one for me. I wanted my wedding day look to be elegant and timeless. Last October my family and I went to Something Blue Bridal Boutique to go wedding dress shopping. I couldn’t have asked for a more perfect day. I went bridal dress shopping with my Mom, Dad, Grandma, and two of my aunts. When we saw this gorgeous Essense of Australia Dress my eyes lit up and I could not wait to try it on. From the moment I stepped into it I felt as though it was made just for me. It was everything I could have ever dreamed of. I loved the clean lines, the attention to detail, and how the dress made me feel. I could not stop smiling when I looked in the mirror. The back of my dress had a gorgeous key hole back with alternating fabric and Diamante buttons all the way down the train. The hand-sewn Diamantes were also on the shoulder straps, keyhole back and waist. As I looked around the room at my family and could see that they knew it was the one too. I could envision myself at the venue on my wedding day, walking down the aisle to marry Jake and I knew without a doubt that this was the wedding dress for me. After I “Said Yes to the Dress”, my family and I went out to lunch to celebrate and then they surprised me later that evening with a “Say Yes to the Dress” Party with a beautiful cake and flowers. In January, my family and I went back to Something Blue Bridal Boutique for an accessory appointment. I wanted to get a headpiece and veil that would complement the fine details of the dress. I selected a gorgeous cathedral length veil with Diamante trim that matched the Diamante detailing of the wedding dress. The headpiece I chose was a headband with Diamante detailing to complement the dress and veil. I also accessorized my bridal day look with the classic “something old, something new, something borrowed, and something blue” elements. For my “Something Old” I wore a cross necklace and bracelet given to me by my Mom and Dad several years ago. My “Something New” was a gift that my Mom and Dad gave me moments before the ceremony started. They gave me a beautiful engraved necklace. The front of the necklace was engraved with the saying “If Kisses were the Stars, We’d Give You the Sky.” The back of the necklace said “Love, Mom and Dad” along with the wedding date “9.17.17”. My “Something Borrowed” were the shoes I wore on my wedding day. I wore the ballet slippers that my Aunt and Cousin both wore on their wedding days. My “Something Blue” was a light blue garter. I remember walking up the steps into the reception space and was in such awe of how my vision had come to life. Jake spun me in my dress for the first time as we entered and my dress billowed around me. I felt like a bride and it felt like the most magical dream." What was the couple's favorite moment of the wedding? "The most special moment was mine and Jake’s first look. Prior to the first look, I asked someone to deliver a note I wrote to Jake as well as two small pictures of his grandfathers for him to place in his pocket to have them with him throughout the day. Jake was positioned looking out towards the field, and as I approached him I was so excited to see him and to see his expression when he saw me in my wedding dress for the first time. I tapped Jake on his right shoulder, and when he turned around it was such a wonderful and precious moment. We enjoyed those few moments of just embracing each other and having that time to reflect on our relationship and our love for each other. Jake then gave me a letter to read as well as a Pandora charm for my bracelet that said, “Just Married”. The expression on his face and the purity of the moment is something I will never forget." 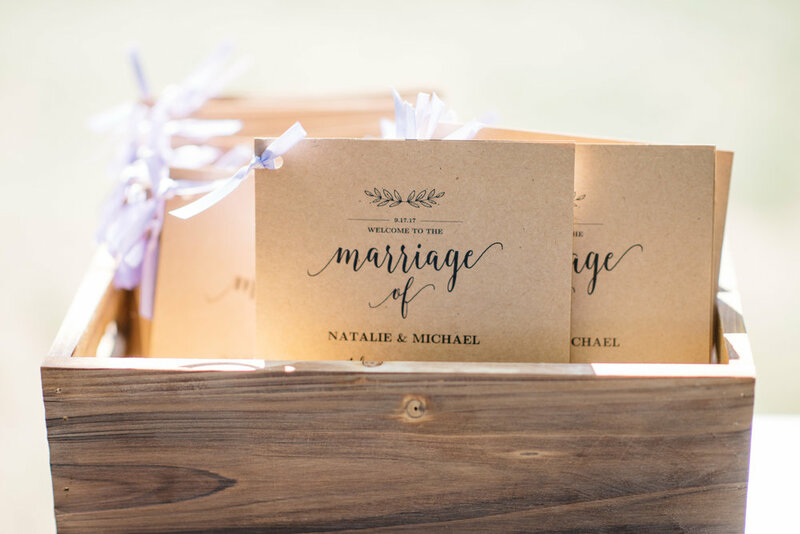 Now that the day has come and gone, what is Natalie's best advice for couples planning their wedding? "Organization is key! I found that making “To Do Lists” was extremely helpful in the wedding planning process as well as creating a wedding binder and notebook. This enabled me to keep track of items that were complete and those that needed to be completed. My advice to engaged couples is to enjoy each and every moment leading up to the wedding. There are so many special memories with family and friends that are created throughout the whole wedding process so take time to live in the moment. Focus on your relationships with your fiancé, bridal party, and all the important people in your life. Invite family and friends to come be part of your big day from dress shopping to cake tasting. A wedding should be a celebration of love – the love you and your fiancé share, the love you and your families share, and a love you and your friends share." Thank you SO much, Natalie and Jake!!! We are honored we got to share your beautiful wedding and wish you so much happiness and love in your future together!! Be sure to check out more of their gorgeous wedding pictures in the gallery below!